Operators are able to monitor harvest through robust map layers that improve the in-cab experience. Ground speed – measurement of distance over time to show how fast the combine is moving at a specific area in the field. This is a new harvest map layer to be displayed in the cab. Moisture – measurement of 0-100 percent that shows the moisture content of the crop for a specific area in the field. This is also able to be displayed and captured in the GreenStar™ 3 (GS3) 2630 Display and 4600 CommandCenter™ display harvest documentation data. Dry yield – measurement in mass per area after taking into consideration the removal of moisture to the standard payable moisture. This is a new harvest map layer to be displayed in the cab. Wet yield – measurement in mass per area for a specific area in the field. This is also able to be displayed and captured in the GS3 2630 and 4600 CommandCenter harvest documentation data. 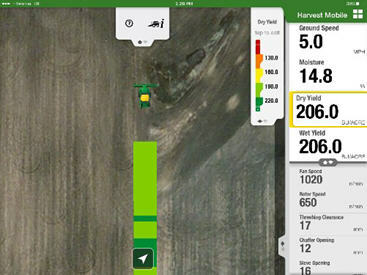 Each data attribute in Harvest Mobile can be shown as a dashboard and map layer. The dashboards are numerical values that represent the current real-time value provided by the machine. The map layers are each documented at one time per second, displayed on top of an aerial image (dependent upon the cellular connection to the iPad® tablet) and have color legends that can easily be edited. In order to evaluate a variety's performance real-time while harvesting, Harvest Mobile operators will need to retrieve their fields' variety maps from the John Deere Operations Center prior to harvest. This can be done over Wi-Fi (not the WDS or MTG Wi-Fi connection to the combine) or cellular connection. It is recommended to load the variety maps prior to harvesting via Wi-Fi to reduce cell plan costs as well as achieve optimal download speeds. Once variety maps are loaded in Harvest Mobile, operators can access those maps at any time via Dual Map Display or Field Review. Harvest Mobile hardware is factory installed on all model year 2016 and newer S-Series combines, making it easy to get started with Harvest Mobile. 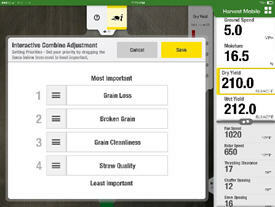 NOTE: Harvest Mobile uses Wi-Fi to stream data between the combine and the iPad. While John Deere has verified the system to work in typical field operations, John Deere cannot guarantee that system performance will not be impacted due to signal interference from non-Harvest Mobile transmitters. Since the 2.4 GHz ISM band is a license-free, shared spectrum, it is possible that other systems may consume bandwidth and degrade the system performance. In order to see two live maps, the app must be connected to the machine via the WDS; however, it does not require cellular connectivity. 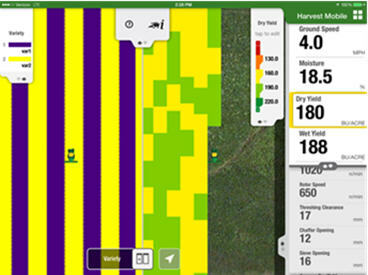 The dual map display experience is best visualized with a cellular connection in order to provide a GPS position (if outside of the combine) and aerial imagery for use as a background. Harvest Mobile utilizes the wireless capabilities of the wireless data server (WDS) or 4600 CommandCenter and MTG and the iPad to send the harvest data from the combine to the operator inside the combine cab. 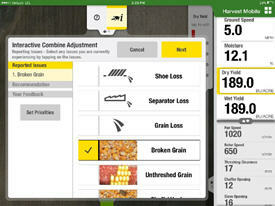 The harvest data is stored on both the iPad and the WDS or 4600 CommandCenter. Harvest Mobile also sends data from the iPad to the WDS to the combine for functionality such as machine setting adjustments with Interactive Combine Adjustment (ICA). 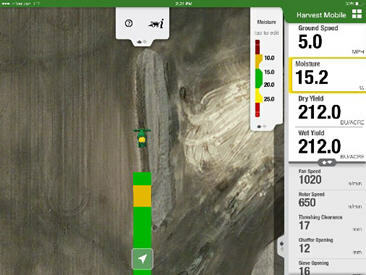 Harvest Mobile utilizes the cellular capabilities of the iPad to sync data to John Deere Operations Center. Data can also be sent to the Operations Center via Wi-Fi when the iPad is not connected to the WDS or 4600 CommandCenter and MTG. See John Deere Operations Center for additional information. Harvest Mobile works directly with the GreenStar™ 3 (GS3) 2630 Display or 4600 CommandCenter™ display, Harvest Doc™ mapping system, and combine controller software to enhance the operator’s experience while harvesting. 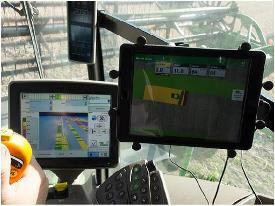 Inside the cab, the operator’s own iPad® tablet is utilized for Harvest Mobile to display critical harvest data. In 9X70 Series STS™ combines through model year 2017 S-Series combines, the GS3 2630 Display automatically sends the required setup information and GPS data directly to the wireless data server (WDS) and the iPad. In model year 2018 and newer combines, this data is processed by the 4600 display and sent to the iPad via Wi-Fi capabilities in the MTG. This reduces the amount of steps the operator has to configure to begin harvest and ensures the accuracy of the data by using the StarFire™ 6000 or 3000 Receiver. 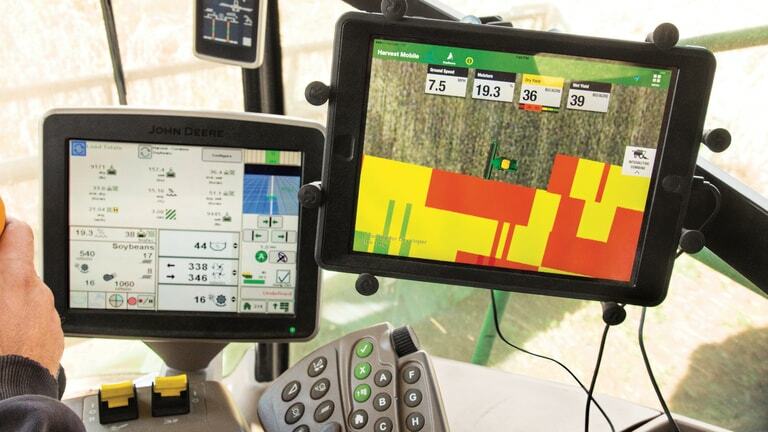 The use of John Deere’s StarFire 6000 or 3000 Receiver provides much greater mapping accuracy of harvest data versus the internal GPS of the iPad. Besides the iPad and the GS3 2630 on 4600 CommandCenter, there are no additional displays added to the cab of the combine for Harvest Mobile. 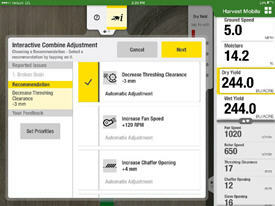 This decreases the complexity of the product and reduces clutter inside the combine cab. In addition, it utilizes the factory-installed sensor technology, reducing the need for additional hardware components and installation time. 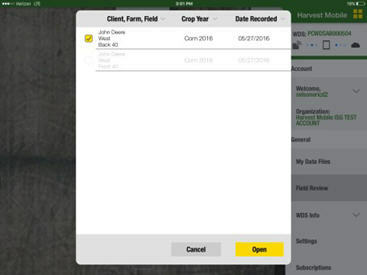 Harvest Mobile also works with a variety of other existing John Deere technology solutions that are utilized during harvest. Please refer to the compatibility sections for all the details. Harvest Mobile makes ICA easier than ever to operate and monitor. 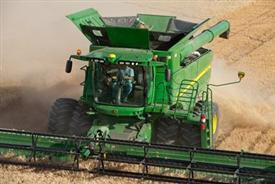 ICA can assist operators to improve the overall daily and seasonal productivity of the combine. This feature is designed to resolve issues operators face during changing crop or harvest conditions and improve combine efficiency. When a recommendation is selected, ICA automatically makes the adjustment. Some recommendations — like ground speed— also offer a manual adjustment option. The result is improved machine performance and a higher-quality harvest. Harvest Mobile also has a run time monitor with key indicators. These include rotor speed, fan speed, threshing clearance, chaffer opening, sieve opening, average moisture, average wet yield, and average dry yield during harvest. Field Review is functionality within the Harvest Mobile app that enables the grower to view the harvest maps of a field that has been started or completely harvested. 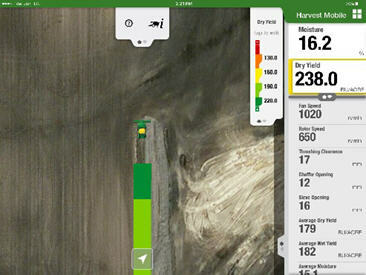 The grower is able to access their harvest data directly from the iPad® tablet at any time or any place. Field Review allows the grower to select the field that has been harvested and view any of the four map layers that were documented during the harvest operation. Field Review provides the grower with the ability to perform basic scouting activities after the crop has been harvested. 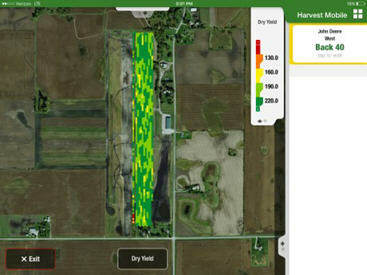 Growers can utilize this functionality to validate high or low performing areas in the field. If the iPad is cellular capable and has an active data plan, Field Review will track the location of the user through the field as they perform their scouting activities.